Lachy sends us all for a morning walk to see if we can find any dingoes or camels. Nobody sees any but some of us see tracks. Today Coober Pedy is on the schedule. 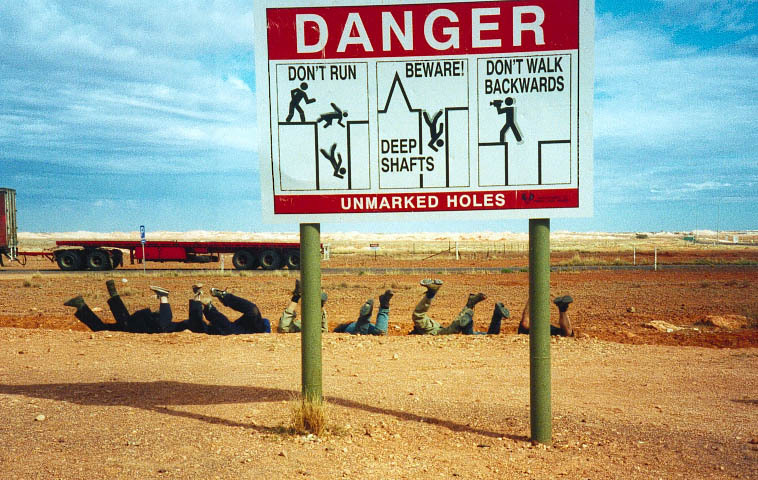 Coober Pedy is an underground town. People dig their houses into the hills or straight into the ground. That way they do not die from the stiffling heat in summer. Coober Pedy is an opal town, responsible for 80% of the world's opal. We cross the Dingo Fence that is supposed to separate the sheep-south from the cattle-north. The fence stretches for about 9600km and is supposed to stop the dingoes. We arrive in Coober and Nathan does another one of his jokes. He jumps into a gully right in front of a sign that warns people for unmarked holes. We laugh and we all jump in for a group shot. After 5 minutes we wonder why the hell Lachy takes so long to take a bloody picture. Ted looks up and sees Lachy and Rob walking towards the car, ready to drive off!!!!! We have a nice hot shower in the town. Except me of course because I had no patience to wait. Mine was cold. Humbug. Ngaire and I have a chickensandwich. Yum, meat. Lachy picks up a girl who will give us a little town tour. We visit an underground church, a house and a mine. Clare finds some opal butit turns out to be the worthless kind. At the opal shop we get the funniest explanation about light and molecules that I have ever heard. Something about light being trapped and giving opal its colour. Rob decides that he isno longer a physicist if the woman's story is correct. We drive into the painted desert to set up camp. But when we get there, it is so windy that lachy decides to drive closer to the mountains where we should be a bit more sheltered from the wind. we end up at the most beautiful camping spot. At the foot of a mountain. Clare, Ted, Emer, Kerstin and I decide to climb the mountain. Something that turns outto be dangerous because itis very brittle. it litteraly comes apart under our hands. butitisworth it because we get to see themost beautiful sunset. The sky turnsa deep shade of purple. That night we have a BBQ. Lachy gets really upset when it turns out we eat all the coleslaw. Pour man. Nathan comes up with a great game. Pick up a beer-box with your teeth. In the end, there is no box left,just a piece of cardboard flat on the ground. The end result is a draw between Nathan and me. We feel specs of rain so we put the tents up as quickly as we can. Needless to say the rain never comes and the tents stay unused.